Qatar’s Crown Prince Sheik Tamim bin Hamad Al Thani and FIFA President Sepp Blatter attend the final match of the Crown Prince Cup soccer tournament. After the arrests of several senior FIFA leaders and widespread evidence of graft, bribery and general corruption at the highest levels of the global soccer conglomerate, FIFA’s selection of Qatar to host the 2022 World Cup has come under renewed criticism. The indictments allege that vote-buying occurred in past World Cup host selections, and there have been other allegations that millions of dollars were paid to rig the vote for Qatar in 2010. And when you look at all the World Cup hosts since 1978, it’s clear that Qatar is in many ways an outlier. Compared with other World Cup hosts, Qatar is at the extremes on almost every metric I looked at. The data wasn’t perfect — two of the data sets I used weren’t measured annually when it would have been ideal if they were (the United Nations Development Program’s carbon-emissions reading and Reporters Without Borders’ Press Freedom Index). Also, the Press Freedom Index did not exist before 2002, so I used the 2002 mark for the World Cups that came before that year. It’s an estimation, but because that measurement is less susceptible to annual change, I felt safe in using it. And one last thing while we’re here: The Elo and GDP numbers for Russia and Qatar aren’t projections but are the most recent data available. Qatar was definitely not selected for its temperate weather in June, the typical time for the FIFA tournament. There has historically been some variation here — Argentina’s average June temperature is in the low 50s (it being in the Southern Hemisphere and all), and Mexico’s is in the mid-70s. But Qatar’s average June temperature is in the 90s. And it’s not like Qatar holds a bulk of the world’s population, either. Typically the country that gets the cup has somewhere around 1 percent to 5 percent of the world’s population, but not Qatar. With a projected population of 2.24 million in 2022, it’ll have a whopping 0.03 percent of the global population within its borders in a few years, not counting the spectators. What’s more, that population mostly comprises people who weren’t born in Qatar — as of 2013, according to the U.N., 1.6 million of the country’s 2.2 million people were international migrants. Although Qatar will be a global hub for sports journalists in several years, FIFA apparently did not select the country to highlight its illustrious human-rights record. 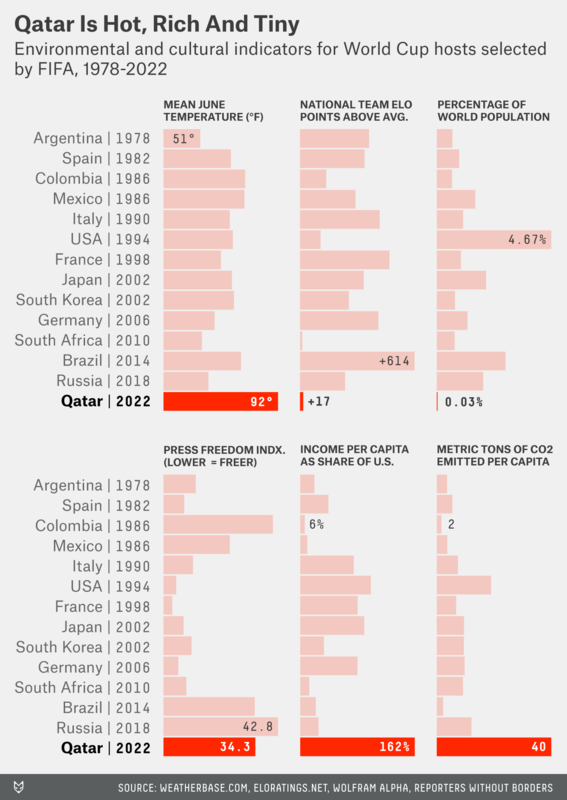 Qatar has extreme restrictions on press freedoms that put it in league with Russia (the 2018 host) and Brazil (the 2014 one). They have a very high score on the Press Freedom Index, where a low score indicates a great deal of freedom. It’s also not for the nation’s climate record, either, as it’s by far the highest polluter — measured in metric tons of carbon emitted per capita. And that’s on a list that includes America. That was our category to lose! But Qatar does have one metric by which it is off-the-charts outstanding: gross domestic product per capita. Namely, it’s a small country that makes a whole lot of money. In the chart, we’re looking at the ratio of GDP per capita the year each nation hosted the cup to the United States’ GDP per capita that year, to keep it apples to apples. None of this proves vote-rigging, obviously. But when a country lacks many of the competitive advantages of other countries’ bids, some extra scrutiny is probably worthwhile. The last game of the previous year for Colombia, which resigned from hosting the 1986 cup and did not play soccer that year, and the most recent game for Russia and Qatar. Might they improve substantially in the next seven years? Sure, it’s possible. But the point is they’re not an unrecognized powerhouse in the sport at this point in time, and the fact that the host nation gets a free bid may mean they don’t have a ton of incentive to drastically improve.